I have made thousands of fine art photographs over the decades, and to make them easily retrievable I use keywords. This way, I can call up every landscape photograph, portrait, or still-life I have shot, or even every picture taken with a particular camera. As time goes on, I add additional keywords to make finding particular photographs easy to do. 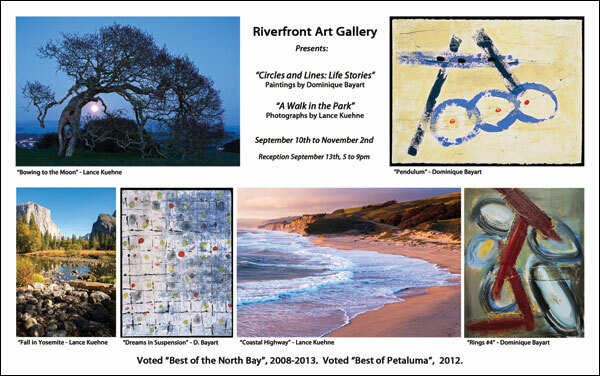 I am one of the featured artists in the current show at the Riverfront Art Gallery, and my show is entitled "A Walk in the Park". It is all about our local, state and national parks in California. I am a great fan of parks. I have been a member of the California State Parks Foundation for many years. Recently, I keyworded my photos as to whether they were taken in a state, national or local park. This way I could find a photo to submit to the foundation for other members to enjoy, or perhaps be in their calendar. I was surprised by what I found. Over 30% of the fine art photographs I have taken of the California landscape have been taken inside a park. I shoot a lot of wine country images, so this was a bit of a shock to me. Since 2014 is the 150th anniversary of the Yosemite Grant establishing the California State Park System, and the 50th anniversary of the Wilderness Act, I thought I would celebrate our various California parks with an exhibition. By the way, the California State Parks Foundation revamped their website in August. The photograph they put across the top of their home page is one of my photographs. That photograph is in this show.